One way to temporarily handle winter leaks is to remove as much snow as you can with a roof rake. They are typically available for purchase through various retailers. Just make sure that the rake you choose has a handle that is long enough reach the roof from the ground. That way, you won’t have to risk your life making an icy climb. While you are raking, make it a point to clear the gutters. Some people opt to do that by filling ladies’ nylons with ice melt and placing them onto the ice. If you do decide to take that route, keep in mind that some deicers can cause structural damage and plant death. So it is important to select an ice melt product that is safe for your structure’s roofing system and landscaping. In some instances, that may be a product made with calcium chloride. If you end up with a clear day and a snow free roof, consider temporarily patching problem areas with plastic roof cement. There are certain types, like Gardner Gibson’s Wet-R-Dri, that may be used during the winter months. 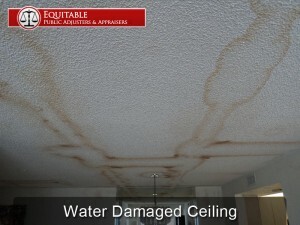 In general, you will need two gallons of the product for every 24 square feet of coverage. Keeping the attic cold can also help stave off problems. To do that, consider air sealing any gaps between the attic floor and the heated levels of your structure. You may also want to install attic fans and insulation as well as refrain from using any heat generating appliances that vent into the space. Using an infrared camera to look for any hidden water damage after a roof leak has occurred is also a good idea. If you don’t want to purchase a camera and do the work yourself, make sure that you hire a licensed professional. Otherwise, you may end up with unreliable test results. Lastly, remember to contact our independent insurance adjusters before filing a winter roof leak claim. 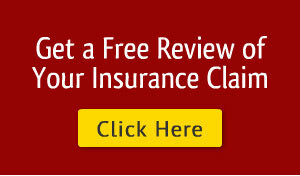 We can help with the paperwork and ensure that your insurance company acts fairly during the settlement process. To contact our independent insurance adjusters in New Jersey and New York, please send us a message online or call (877) 869-8989.